The Seven Skies wreck was a supertanker that sank close to Tioman island in 1969 when she suffered an explosion. 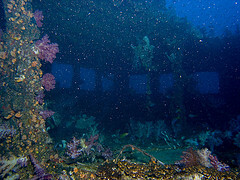 She now rests upright in 64m of water and the superstructure is still intact. She is 262m long and 90,000 tons. The funnel is the shallowest point of the wreck at just 18m below the surface. The bridge is at 30m. The main decks start at 45m. There are many easy swim-throughs and penetrations around the superstructure that are suitable for recreational divers and deeper areas to explore for technical divers. Lots of marine life is seen on the wreck, including plenty of pelagic visitors like barracuda and trevally. Manta rays are often seen here. Soft coral and encrusting sponge covers the whole superstructure. Scorpionfish are numerous, camouflaged all over the wreck. Lionfish, moray eels and various crustaceans can also be seen. Visibility can be very good, up to 50m, although 20m is more common.